This is our 3rd time to go to the durian farm with Lynn. Interestingly, every year my impression towards durians gets better. I even felt "wow, what a fruity fragrance I can feel" when we got into the farm this time. 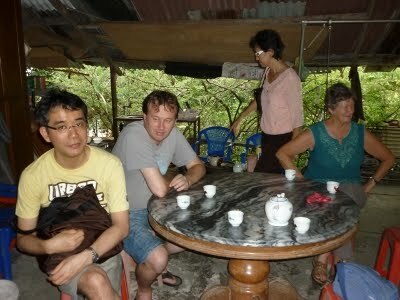 We went to the farm because my brother decided to visit Penang for the first time. His sole purpose is going to eat durians and his holiday was very short. He took an overnight flight from Haneda after leaving office on Thursday, then gone home this afternoon after spending only 2 nights in Penang. 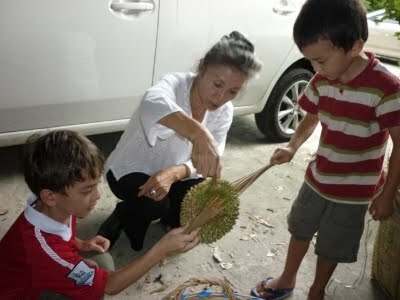 Lynn's mother told us how to wash the smelly fingers after eating durians. 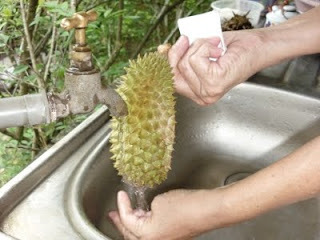 Rinsing them with running water flowing over durian skin. Interesting ritual! Durians gown in the trees. Once they become ripe, they drop. Durian farmers walk around under durian trees to pick up fallen durians from the ground, for a couple of times a day. 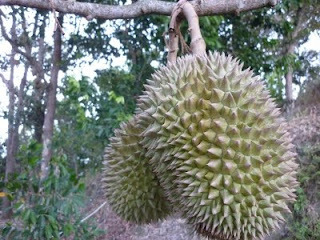 Durians have very thick and spiky skin and they collect old leaves plucked into the spikes. Using a small hand-made brush, farmers get rid of the leaves. Aratakara tried this. I almost started to believe that durians are not so smelly. Well, the unpleasant smell can't go away after coming back with a couple of durians in our car. This smell is surely stinky! It reminds me of supermarkets in Singapore - they often sell packed durians. 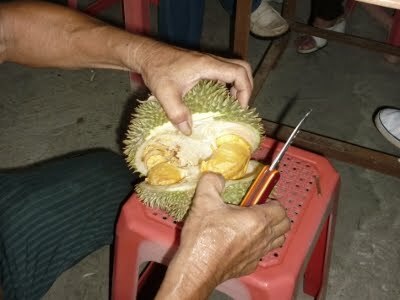 You shouldn't leave durians in air-tight places, for sure.